Innovative Wireless Technologies, Inc. 1100 Main Street, Lynchburg, VA 24504 iwtwireless.com 1-434-316-5230 Whatever you're mining — MINE the DATA™ HDRMesh™ The best choice for your underground data network. IWT's High Data Rate (HDR) solution brings reliable wireless data transmission from the "last mile" working area. 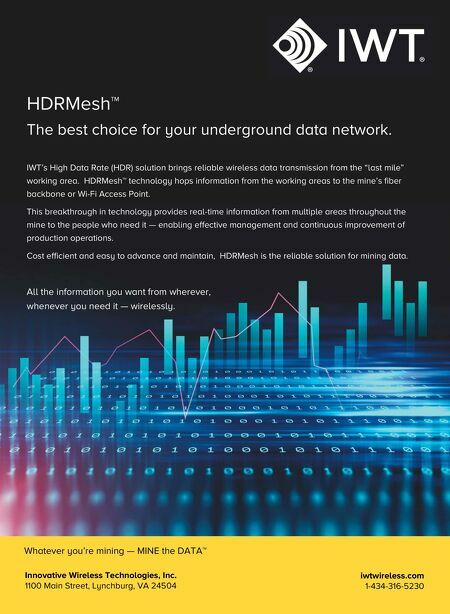 HDRMesh™ technology hops information from the working areas to the mine's fiber backbone or Wi-Fi Access Point. This breakthrough in technology provides real-time information from multiple areas throughout the mine to the people who need it — enabling effective management and continuous improvement of production operations. Cost efficient and easy to advance and maintain, HDRMesh is the reliable solution for mining data. All the information you want from wherever, whenever you need it — wirelessly.